On 9th August 1971, internment was introduced into the Occupied Six Counties. Family homes were raided; front doors smashed in, men were dragged from their beds and ripped from their homes in front of their hysterical children and fearful wives who knew not where their loved ones were being taken to, why or when they would return. Many internees were held in captivity for years despite not having been found guilty of any offence. The same practice remains in place today albeit on a smaller but equally unjust scale. Today it is often said that we live in a better society - ‘a new dispensation - is the oft repeated phrase of those attempting to paper over the cracks. Despite all the supposed ‘changes’, many of the old repressive injustices remain including internment, political policing, Diplock courts and ongoing MI5/British military activity. Almost forty two years have passed since that August morning in 1971, yet Irish men and women are still being interned at the behest of the British state, arrested by its willing armed forces, including the PSNI, and aided and abetted by their political apologists in Stormont. Political policing and internment is nothing new. They are practices which have been in place for some decades, practices that we in eirigi have been to fore in highlighting, exposing and opposing. As a result, those of us who have been most vocal in opposing these unjust activities and our families, have paid a heavy personal price in the form of constant PSNI harassment, frequent ‘stop and searches’, house raids, assaults, threats, intimidation and, ultimately, the loss of liberty. In late November last year I penned a letter which was published in the local press in Newry. My letter highlighted a number of unacceptable practices in relation to Britain’s police force - the PSNI - something which I had done many times over the years. The letter described, in detail, dawn PSNI house raids and the traumatic effects they have on families, particularly young children. Ironically, less than 24 hours after my correspondence was published, the front door of my own family home was smashed in by the PSNI at 6am. In the very same manner as I had described in my letter, I was torn from my home, family and children and have been interned in Maghaberry Gaol ever since. Those unfortunate to find themselves interned by remand, despite not being found guilty of anything, can be imprisoned for lengthy periods with no sign of either a date for trial or release. Political internees can find themselves in gaol for up to 2 years, or more, under this repressive, draconian policy, awaiting a trial that may never come and facing a case that will likely collapse, as we have borne witness to countless times before. Despite the continued practice of political internment there seems to be little or no public opposition regarding its use when contrasted to the widespread public outcry witnessed in previous decades. No mass public demonstrations but rather low key protests and pickets organised only by those close to those imprisoned. 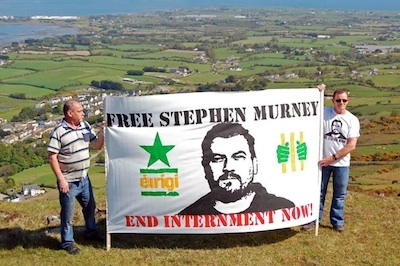 Perhaps one reason for the lack of public opposition to internment could be that rather than employing the levels of mass internment witnessed in the early 1970s, we now experience what can be described as ‘selective internment’, whereby relatively small numbers of people - considered as opponents to the established parties - are targeted for imprisonment. Among those currently interned include those who, using their democratic right, vocally, publicly, politically and peacefully oppose the ongoing British occupation and its puppet administration at Stormont. This suggests that the use of ‘selective internment’ is designed to target the few in order to intimidate the many from standing up, speaking out and organising a radical opposition to the Stormont regime. Could what we are witnessing be described as an ‘acceptable level of injustice’? Where people are too afraid to speak out in case they too find themselves within the sights of the PSNI, British Army and MI5? Internment was wrong and unjust in previous years and it remains as equally wrong and unjust today. I would encourage all those that disagree with its continued use to organise and publicly oppose internment in its current form. “Injustice anywhere is a threat to justice everywhere.” - Martin Luther King Jr.